Virtually every major country on earth has a single artist who might be called the "grandfather" of that country's artistic tradition. In Italy it would be Leonardo. In France, Jacques-Louis David, in Spain, Velasquez, in the U.S., Charles Wilson Peale, in England...well, here you can take your pick, Hogarth, Gainsborough, or Reynolds. Anthony van Dyck would be the obvious choice but he was Dutch. Among the Netherlandish painters, the grandfather of them all would be Rembrandt. Among the smaller countries, the progenitor might be lesser known, perhaps all but unknown to most of us. Ever hear of Johannes Sveinsson Kjarval or Ásgrímur Jónsson? Kjarval is often considered the "grandfather" of Icelandic art, even though Jonsson was slightly older and tutored Kjarval in the basics. They both did somewhat similar work. As with England, and probably other countries as well, it's something of a toss-up between Jonsson and Kjarval. Jonsson was primarily a watercolor impressionist, painting bright landscapes of his native island as well as its Nordic heroes and legends. He was Iceland's first professional artist and a major influence upon many Icelandic painters to come. 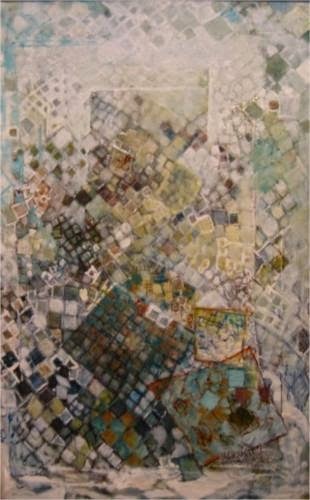 He also had a penchant for leaving paintings unfinished. 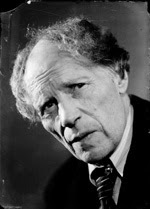 Born in 1876, he was nine years older than Kjarval. 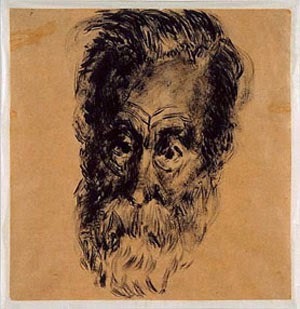 Kjarval was more expressionistic, sometimes delving into Cubism and other forms of abstraction. His landscapes, are in fact, mostly what we'd call abstractions. They are rich in color but not bright and pretty as were Jonsson's. 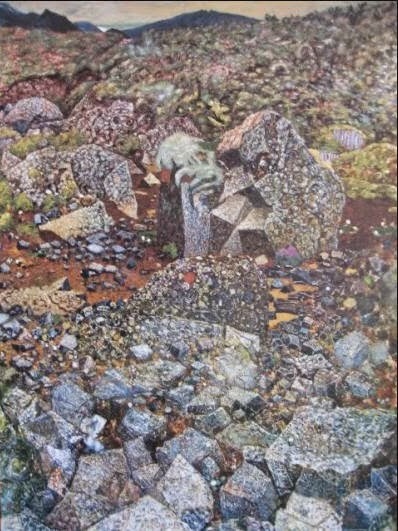 Kjarval loved to paint the Icelandic lava fields, highlighting their "volcanic" abstraction and seeing in them faces and figures, often of uncertain meanings. 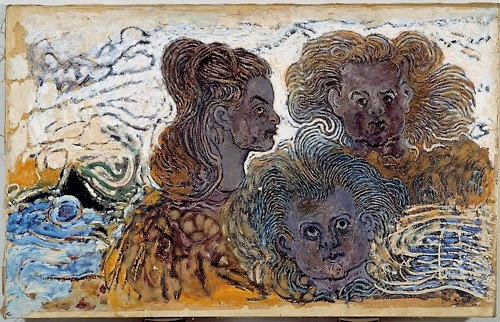 His The Sisters of Sapi (above), from 1948 is typical of this trait. He was also adept at portraits (below, right) and often used animal figures in his works. 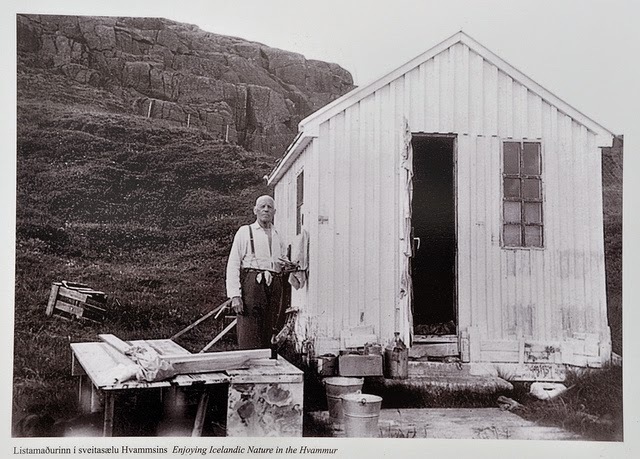 Jóhannes Kjarval's summer studio shanty on a farm near Kjarvalshvammur. Kjarval was something of an Icelandic legend himself. He was born in 1885, one of thirteen children. Family poverty caused him to be raised by foster parents from the age of five. They had in mind that he should become a respectable businessman. Instead, he worked as a fisherman until he was twenty-seven, at which time, with the support of the Icelandic Confederation of Labor he was off to Copenhagen (Iceland was Danish at the time) to study art at the Royal Academy. Over the years, during the winter months, Kjarval rented living and studio space in Reykjavík. During milder seasons, he took to the raw northern part of the island where a farmer allowed him to camp out in a tent near the sea shore. Later the farmer built the painter a small shanty near his favorite painting location. This tiny cabin and the surrounding area were the only property Kjarval ever owned. Even though he often painted on location, the effort was mainly one of deriving inspiration rather than details from the landscape. One photo even shows him painting a group portrait, outside, "on location," his subjects no where to be seen. 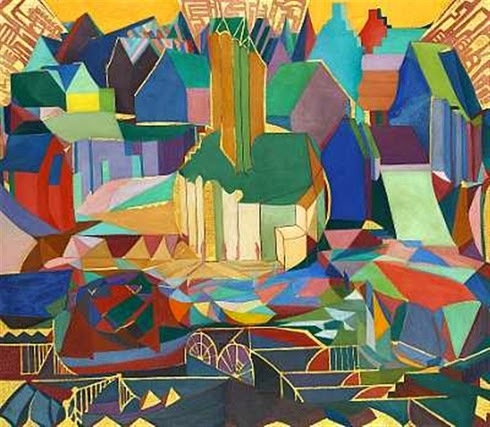 Hvitasunnudagr, 1919, Jóhannes Kjarval, one of his earliest works displaying cubist influences, not at all like his later Icelandic Expressionist landscapes. Unlike Ásgrímur Jónsson, Kjarval was more than just a landscape painter. Often in the past, his critics have faulted his work by framing it among the landscape genre. Kjarval's work goes beyond that, and much deeper, exploring both the look and feel as well as the shapes and substance of the Icelandic countryside. For the most part, Jonsson painted what's come to be termed "local color." 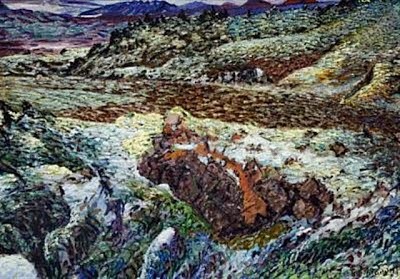 Kjarval, while inspired by what he saw and felt painting in the open air, is much more in tune with the Modern Art of his day, distilling the landscape, painting it in his own Icelandic style and manner. He justly deserves the "grandfather" honors. Apparently his country sees it that way too. His image graces a 2000 Kronur bank note (below) issued in 1987, fifteen years after his death in 1972 at the age of eighty-seven. Jóhannes Sveinsson Kjarval--onto big money.